Like new, in opened shrink with no issues. Disc appears excellent. 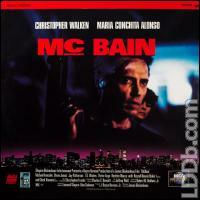 McBAIN,US RELEASE ON MAY 14,1992.FULLSCREEN.DISC HAS SOME HAIRLINES.CLEAN.JACKET ALMOST LIKE NEW.VERY MINOR SEAM WEAR ON BOTTOM. NO FADING,CREASING,CORNER JAMS,OR DISC SEAM "EXPRESSION"TEARS TO NOTE.GREAT CONDITION!!! Disc shows wear.inventory sticker. Jacket is VF Condition! some spine stress lines, $15 price sticker. Comes with New Protective Sleeve! ~ COMIC JUNGLE ~ $4.00 S&H in the USA will combine shipping with multiple purchases.